Do Herbal Supplements Really Help Treat Dizziness? Not having a steady foot on the ground can be frustrating. If you often find yourself falling into things or having to shut your eyes just to get the room to stop spinning, you may suffer from severe dizziness. While dizziness is often a result of vertigo, it can also be caused by more temporary circumstances such as a sudden drop in blood pressure, dehydration, and excessive exercise. Supplements may help dizziness, but many are not approved by the Food and Drug Administration, nor have they been scientifically proven to be effective. According to the University of Maryland Medical Center, ginkgo - one of the most widely used supplements - has been shown to help treat dizziness. 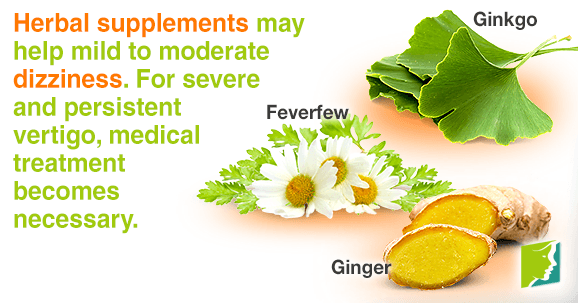 Ginkgo supplements, which come in the form of tablets, capsules, dried leaves, and liquid extracts, contain terpenoids that increase blood flow in the body and reduce dizziness. Experts advise against the use of gingko for pregnant or breastfeeding women, as scientific research has not extended that far. Feverfew is another herbal supplement that The National Center for Complementary and Alternative Medicine says is used to treat dizziness and headaches. Another recommended supplement to counteract dizziness is ginger. Available as a fresh or dried root, in tablet and capsule form, or by way of liquid extract and tea, ginger is most commonly used to treat nausea and motion sickness, two symptoms that often go hand-in-hand with dizziness. For more serious and persistent cases of dizziness, medicine is prescribed. Because there can be disease-related causes of dizziness, such as Ménière's disease and Parkinson's disease, natural medicine simply is not enough. The unfortunate downside to medicine is all the possible side effects. A doctor can help you analyze whether or not the benefits outweigh the risks. Which Route Do I Take? As mentioned before, not having a steady foot on the ground beneath you can be inconvenient. If you often find yourself falling into things unpredictably, you may suffer from dizziness. It can be related to hormonal changes during menopause or even external factors, like dehydration. Supplements may help mild to moderate dizziness. For severe and persistent vertigo, it is likely that an underlying disorder is causing it, in which case medical treatment becomes necessary. However, if you are certain there is not an underlying, more serious problem relating to the dizziness you're experiencing, then herbal supplements are worth a try. They generally present less side effects than medications and drugs, and many patients find them to be more affordable. Read more about treatments for dizziness. Read all about six things to know about dizziness during menopause here, from how to identify the symptom to prevention, management, and much more. Can Certain Foods Prevent Dizziness? Dizziness is an incredibly distressing problem that can be scary for any woman. Keep reading to learn which foods prevent dizziness.